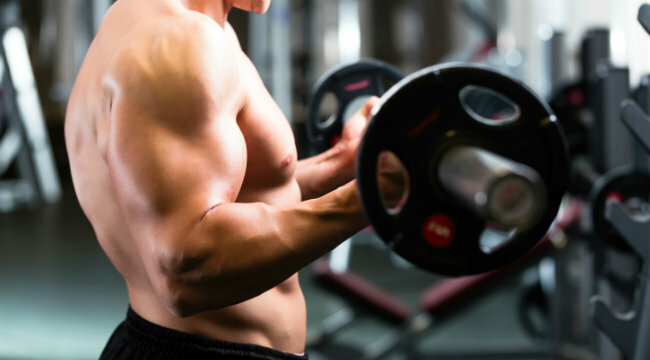 Switch your grip and give this biceps workout a try for more muscular arms. Should I switch my grip width (wide or narrow) on barbell curls to build bigger biceps? The barbell curl is king when it comes to building biceps mass, as it adequately hits the biceps muscle group. But you can get even more from this old standard by changing your grip width to alter the angle of stress placed upon the biceps muscles. Regular Grip: For most bodybuilders, this refers to a shoulder-width grip. In this position, the arms are fairly vertical and the biomechanics for the curl are optimal. This grip allows a fairly even contribution from both biceps heads and the brachialis to curl the weight. Wide Grip: Any grip beyond shoulder-width is considered wide for the barbell curl, but about 6 inches wider than shoulder-width is average. A wide grip places more emphasis on the short head of the biceps brachii. Narrow Grip: Any grip less than shoulder-width is considered narrow. Most bodybuilders find that the closest they can comfortably get is about 2 inches or so in from shoulder width, or just beyond hip width. A narrow grip shifts more emphasis onto the long head of the biceps. Varied Grip: Although a shoulder-width grip hits all the biceps muscles hard, it's important to modify your grip from narrow to wide (and in between) to stress the biceps muscles from as many different angles as possible, resulting in the fullest, most complete development.